Here’s the thing about ordering fabric online: It is a little like gambling. You can make educated guesses or go on gut feelings, but at the end of the day it’s often just a game of chance. The fabric I ordered from Denver Fabrics arrived last Friday in time for some weekend sewing. The brown pinecone themed fabric was a terrible, disappointing disaster. It was shiny, stretchy and so unbelievably slippery I couldn’t even fold it back up after taking it out of the package. Ever the rescuer, I thought I might be able to use it if I sewed with the backside out, as it was less shiny and had a nice muted color. It did look a little inside out when you got really close, but from farther way, it seemed like I could pull it off. I tried sewing with it, using Simplicity 2886, but the whole thing was a mess. It puckered, the needle caught the fibers, it moved around, it wouldn’t press or crease, in short: I hated it so bad. I got about halfway through the bodice construction and threw the whole damn thing in the trash. I know if I kept it I’d keep going back to it, trying to make it work, but it’s just not worth it. That fabric was from hell. If there is a bright side to all of this, I have learned that “polyester charmeuse” is even worse than it sounds. 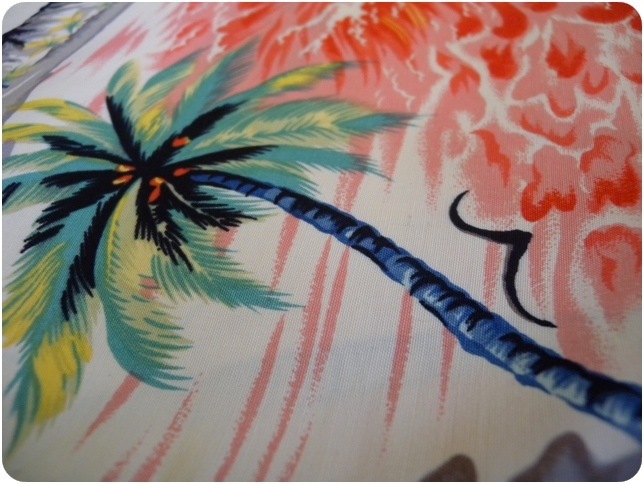 The other fabric I bought, the Hawaiian print, is freakin’ amazing. Holy hell, if I didn’t know better I’d think it was actual deadstock rayon from the 40’s. The site said it’s cotton but it looks and feels so much like old school rayon I have a hard time believing it’s as simple as that. And it’s beautiful. The colors, the print, just wow. I’m tempted to make a pake mu’u out of it just because it’s so perfect for it, but that cut is so unflattering on me I think it’d just bum me out to wear it. 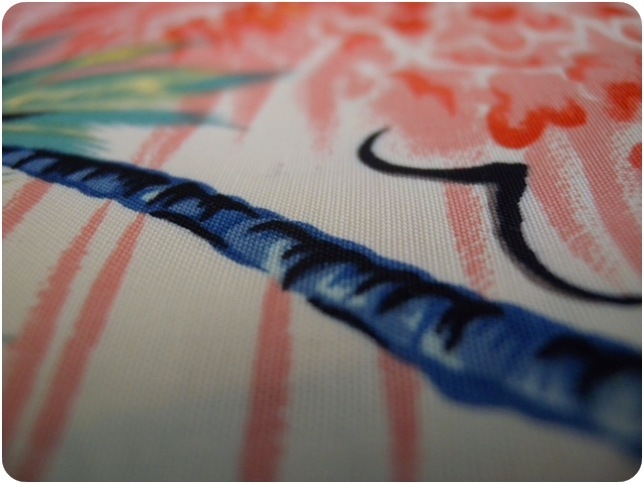 So I will probably make something else Hawaii-inspired, though more suited to midgety fierceness. But I’ve gotta ask, plead, beg any other seamstresses out there to make one themselves out of this fabric. Oh, and the best part, it’s on sale for $4.95 a yard!! I can’t even… Just buy some. Please. This is like a gift from little baby Jesus. Or Pelé. Little baby Pelé. 10 Responses to "Fabric tragedies and triumphs"
Wow you scored! Can’t wait to see what magic you weave into it! I’ll keep my eyes open for similar fabric over here. Thanks, Sistre! I’d love that. I figure there must be tons of this stuff in Hawaii. 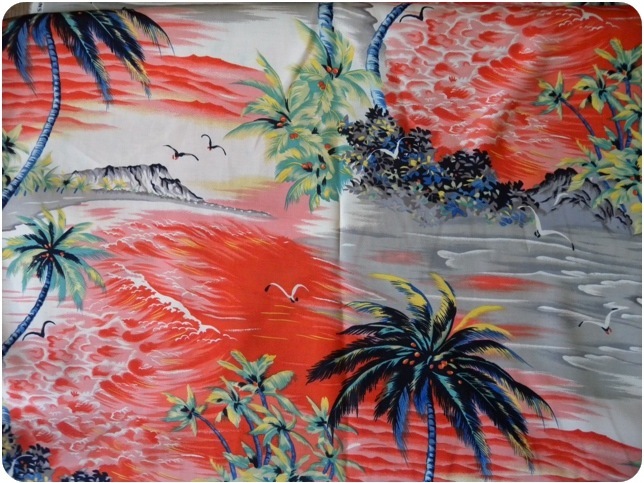 I’m sorry to hear about the polydisaster, but OMG that Hawaiian fabric is amazing!! I can’t wear that style either but man oh man! My gears are grinding to think about what I could make out of it. I know! I felt like I needed to get the word out to all the other vintage sewists. It was like finding the holy grail. I looked at the info on the selvage and it looks like it might be from 2000 so it’s probably pretty hard to find by now. I did a search for the maker and nearly nothing came up. Get it while it’s hot! Maybe if a bunch of us buy some would could do a sew-a-long, each making something unique with it? Oh man, that would be so much fun! I am totally going to rifle through my patterns and even if it’s not something I think I’m capable of sewing yet, I can always hold onto it for awhile until I am! “Little Baby Pele” is the funnist thing I’ve read in ages, and will be the centerpiece of the new front yard Hawaiian-themed nativity I’m now planning for Christmas. If this doesn’t win me the Village Holiday Decorating Award, nothing will. As for your pinecone fabric mishap, now it can be said: I never really bought that those were pinecones anyway; they look more fronds. Not only learning a lesson, you have also been spared both a fashion and botanical faux pas. Oh my goodness, I think you’re right. 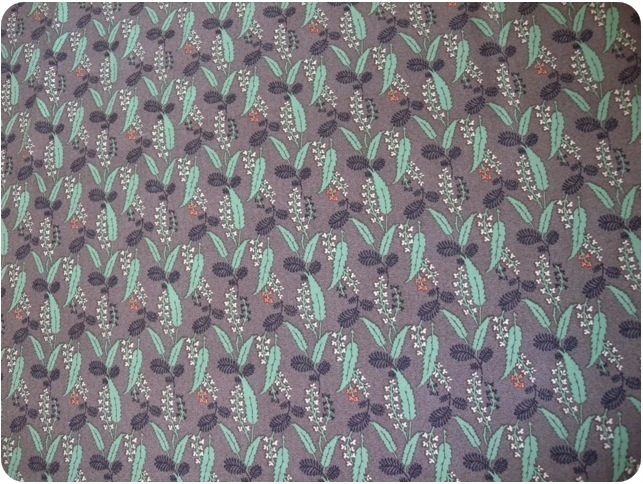 I totally saw pine cones there — clearly I wanted to see something more in this fabric than was there on several levels. A Little Baby Pelé Nativity scene sound hilarious! You have to do that and take tons of photos. create a Waikiki Winter Wonderland, so I’m making myself a mai tai and getting out my sketch pad for some serious planning. Yay! I love it. You will be the best house on the block.